Desktop Intelligence 3.1 is the last commercial version and SAP Business Objects Business Intelligence 4.0 NOT included Desktop Intelligence. Desktop Intelligence will continue to be supported on XI 3.x for Mainstream maintenance: Until 2015 and Priority-One support: Until 2017. End of 2015 there won’t be any update / maintenance (other than priority) for Desktop intelligence and user won’t get any updates from SAP. Since web Intelligence reports has almost all the Deski report features, we can better to move Webi reports. Also Webi has more powerful features than Deski and there is no need to install local for all the users’ machine. Please click here to know more about Deski to Webi report feature comparison. How to we convert the Deski reports? Convert the Deski reports using Report Conversion tool (RCT) and update them accordingly. 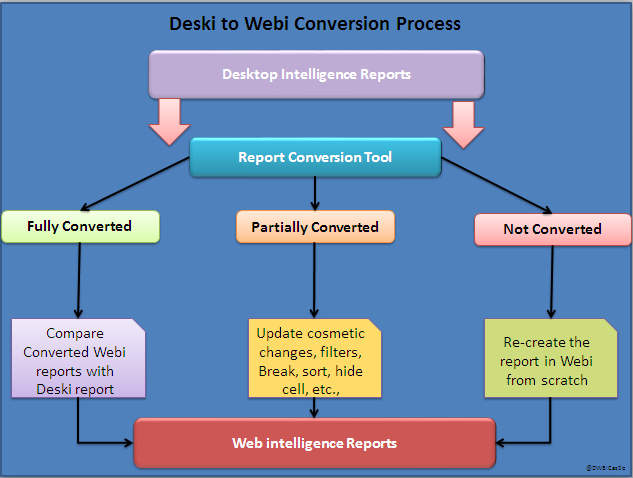 Below is the Report conversion Tool lifecycle process. The Report Conversion Tool (RCT) converts SAP Business Objects Desktop Intelligence XI 3.1 reports to Web Intelligence 3.1 format and publishes the converted reports to the CMS. The tool does not convert all Desktop Intelligence features and reports. The level of conversion depends on the features in the original report. Some features prevent the report from being converted. Other features are modified, re-implemented, or removed by the tool during conversion. For more details about feature comparison, please click here. RCT assigns one of three status to each report after the conversion. Fully Converted– The report structure and format are the same in Deski reports and we may need to do very minimal level of cosmetic changes and some Calculations in Webi (because Deski & Webi are using different calculation engine) to get 100% quality reports in Webi. Partially converted – Some report features were converted to Web Intelligence, but not all. Below is the summary of partially converted reports logs. • A formula from a Desktop Intelligence block filter cannot be migrated into a Web Intelligence block filter. • Across options for cross tabs are not available in Web Intelligence. • Block filters on measures do not have the same behavior in Web Intelligence. • Breaks in Web Intelligence can only be set on objects present in the block. • Breaks in Web Intelligence can only be set on one dimension. • Conditional or Permanent Hide Block not available in Web Intelligence. • Conditional or Permanent Hide Cell does not exist in Web Intelligence. • Detail variables have no associated dimension in Web Intelligence. • Function not available in Web Intelligence. • Keyword not available in Web Intelligence. • Objects cannot be hidden in Web Intelligence documents. • Page break header after page break is not available in Web Intelligence. • Page setup options are not implemented in Web Intelligence (First page numbers, page order, scale, Fit to N pages). • Sorts on query objects are not supported. • Web Intelligence Query is different from the source. Not Converted– Deski report was not converted because it contains critical features that have no Web Intelligence equivalent. All Not converted reports should be created from scratch in Webi and few of them are not really re-creatable in Webi too (VB Data provider, Free Hand SQL, etc.,). The features which are not converted in Webi reports are listed below. • Variable references another variable which could not be migrated. Above summary logs shows conversion history when you convert the Deski reports to Webi reports through RCT. Apart from the RCT logs, Webi reports will have some more issues for Fully & Partially converted reports. I have listed some of issues we have found in our conversion reports. • In the structure mode report will not go to 2nd page. • There is no percentage format. • Date columns is displaying in mm/dd/yy format. • Alignment and border of tables, cells (header, footer and body) is not accurate. • There is no support for dotted line border. Workaround solution for Not Converted & Partially Converted reports are described below. In which some features are not really hard to update in Webi reports and some of them very easy to achieve compared to Deski report functions & features. At high level it is possible to convert all Deski to WEBI format. Based on the complexity and report conversion result log we need to decide on the approach for conversion. It seems with our first level of analysis that 80- 90 % of reports will be converted first with the report conversion tool then need to rework to match the existing Deski reports. Note: 100% pixel to pixel format matching of the reports seems difficult because of feature limitation in Webi. • If the Deski report created based on XML as data provider, Visual Basic Data Provider and Freehand-SQL data provider, those reports cannot be recreated in Webi report. • When Deski report has “Save option with protection password”, you have to remove the password protection by doing save as and migrate to Webi reports. • Deski report having “Variable references another variable which could not be migrated” and you have to be recreated scratch. • One dimension of the same data provider is linked with more than one dimension – You have to unlink the unnecessary objects from same data provider and then migrate to Webi report. Do the required changes in Webi report based on Deski report.